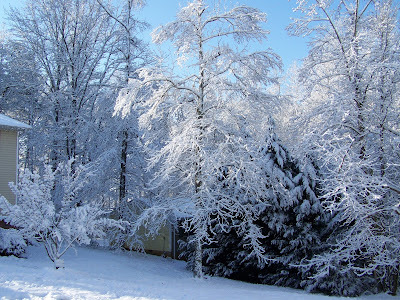 Since I'm not doing anything else right now, I thought I'd show you some pictures of the snow we had. I took some great shots and would like to show them to someone before winter is over! Growing up in Colorado, snow is a part of winter, and I learned to just love it! That's been one of the hardest parts of being in Georgia, is not having the snow. 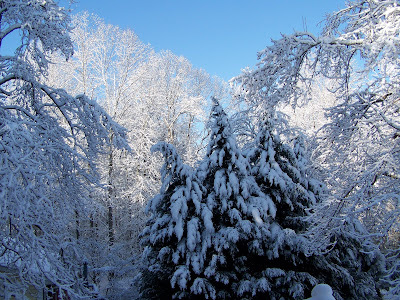 I am so thankful that since we've moved here, we've had one really good snow each year. 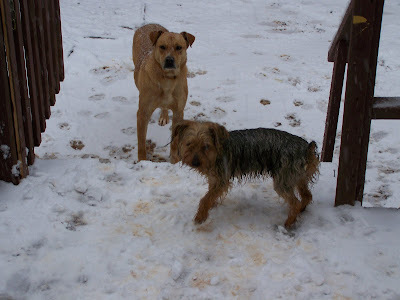 The kids and I were so excited when we saw this accumulating outside... My poor dog turned into a drowned and muddy rat! All three of them loved it though...I couldn't get the little two to stay inside... Absolutely breathtaking as the sun pops up over the top of the trees! 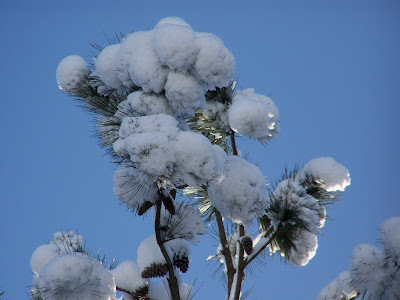 These trees aren't made for snow, but they sure look pretty covered in it! 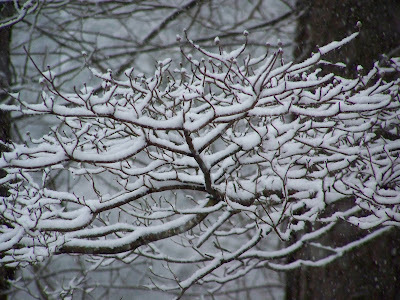 At least this time, the branches didn't break under the weight of the snow, they all held up fine. I could of stared at the trees all day! Such a bummer that the snow melted that same day. 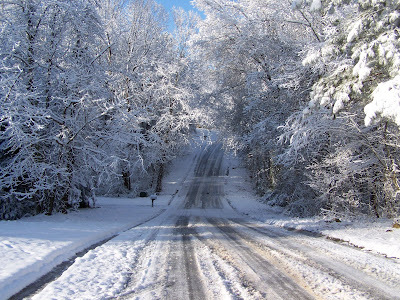 I'm just thankful I have these pictures... You don't see roads like this very often around here! 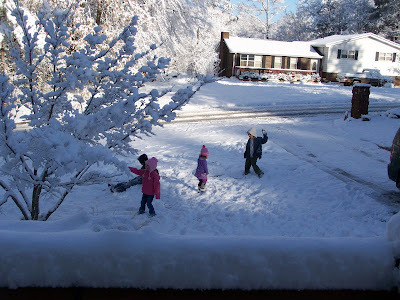 It took us several tries to get up the hill when we left in the van a little later that day... Needless to say, the kids were having a ball with all that snow! We had to drag them back into the house to warm up. They really miss all the snow we had in Kansas. Hubby doesn't miss shoveling it all though. 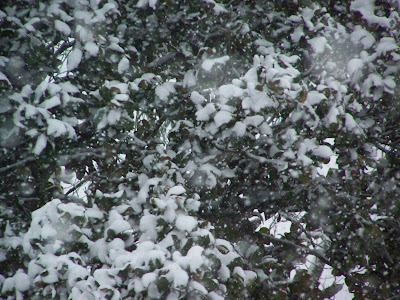 Kansas has had some record breaking snow fall amounts since we've left, and hubby is soooo glad we missed out on those! I grew up with snow, but I don't miss it one bit. My kids would love to see snow. Somehow I don't think South Florida will be getting any, though it has been a cold winter for us as well. It was actually in the 40's this morning, which is usually unheard of this time of year. I think if we got snow here the whole county would be at a stand still; no one would know how to drive in that kind of weather. I'm glad your family had a chance to enjoy the snow without having to shovel it! That's hard work! The pictures are beautiful, I must say. There's beauty in every season. I just like springtime best! Well, you don't have to wait long, Arlene! People in Georgia can't hardly drive in it either. It's deffinately a learned art, and you can't learn if you don't have any! I don't miss the accidents, and the shoveling snow...but I really do miss seeing it all the time. Those are some great pictures! I love snow, but I'm looking forward to spring. Hey, you changed your name! But I know it's you. Love the photos/ even though I'm ready for Spring! Might as well enjoy it, if you have it.